Stylishly asymmetrical and beautifully designed, The Giving Tree is an elegant medical alert bracelet. 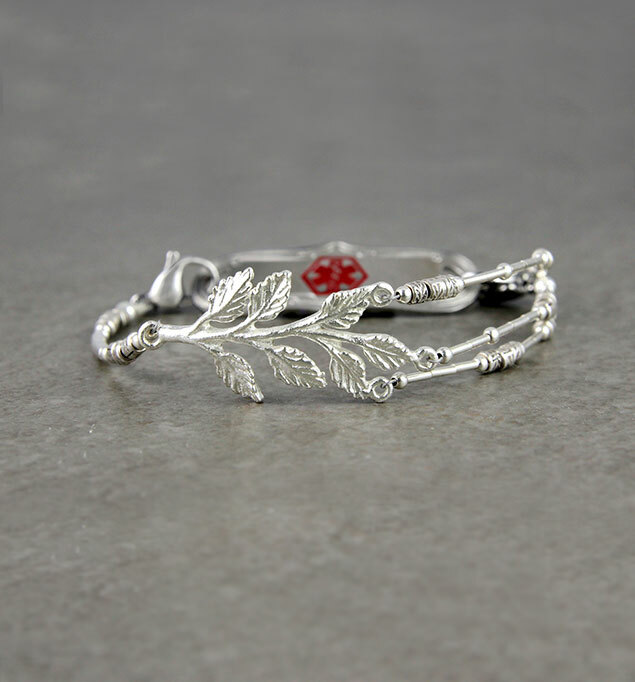 The lovely silver-plated branch centerpiece is balanced by one sterling silver beaded strand at the base and three coordinating strands flowing from the topmost leaves. Pair your Giving Tree medical ID bracelet with any custom-engraved Lauren’s Hope medical ID tag. This bracelet is suitable for everyday use including hand washing and bathing. What is interchangeable medical ID jewelry? Our signature style of medical alert interchangeable medical ID bracelets feature a bracelet strand with a lobster clasp at either end and a medical ID tag (sometimes called a medical ID plaque or medical ID plate). Using the lobster clasps, you can easily move your custom-engraved medical ID tag from one bracelet strand to the next, allowing you to update your look to suit your mood, style, or activity. Likewise, when it’s time for a new medical ID tag, you can order the ID tag portion alone and it will work with your entire existing interchangeable medical ID bracelet wardrobe. Efficient, stylish, and designed to save you money and eliminate waste, interchangeable medical ID jewelry is always an excellent option. Custom-engraved medical alert jewelry means you can wear what you like. No need to search for the, “allergy alerts” or “diabetes bracelets,” because every ID works for every condition with custom engraving. Choose the style(s) that work for you, and we will custom engrave your medical ID tag with your name, medical condition(s), treatment considerations, and emergency contact information.